I’ve had a wonderful first 36 hours of 2011. 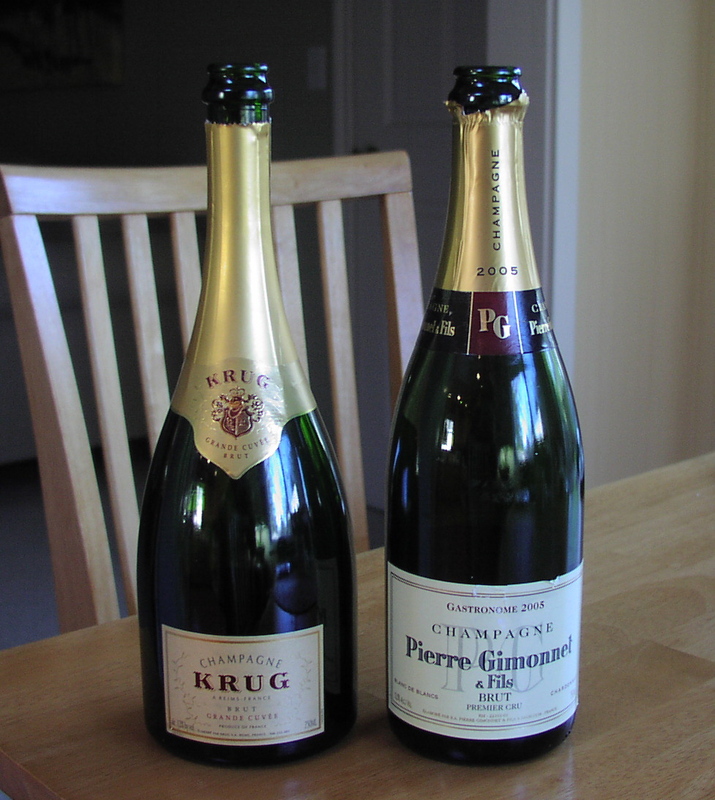 It began with two delicious bottles of Champagne: our last bottle of Krug, and then something new to us, a 2005 Pierre Gimonnet & Fils. The Krug, of course, is the king of Champagnes. It has a layered, aromatic, toasty arrogance. The Pierre Gimonnet was quite different: creamy, almost, but also complex and structured. Both made me smile like a lunatic. So did the food: beet salad (red and golden, over arugula, with a champagne and mint dressing), lamb stew (one of my favourites, just mind-bogglingly rich-but-delicate comfort food, best served with big chunks of wholewheat bread and the best butter you can find), pavlova. Yesterday, before lunch, we went to the park. The air was brilliant: hard, endless blue sky, glittering sun, crisp as an apple. We walked along Piper’s Creek, which runs east to west along a narrow (30 yards?) valley with wooded slopes rising steeply on each side. The south wood is mixed deciduous: big-leaf maple and black alder mostly, with tangled vines of all variety at the water’s edge. It’s all bare now, black and grey and that severe winter brown, green only with moss and ferns sprouting from clefts between branch and trunk like little green fountains. The sides of the valley are steep. The sun doesn’t rise very high. Even just after noon on a clear day, the valley floor was in shadow. Everything was coated in a thick layer of frost, as though a frost giant had just breathed on it. I’d forgotten how dry frost makes things look, burnt and desiccated. The alder leaves could have been gigantic furry woodlice. Unreal. Something on the south slope scampered among the bare trees: too large for a squirrel, too small for a raccoon. A marten? I heard it, but didn’t see it. On the walk back to the car, the sun hit the top of the bare trunks of the north slope, and they glowed gold and green. The birds were quiet. I've seen martens at Discovery Park, or at least what I thought were such. Someone told me they must have been fishers, although the difference is too subtle for me to worry about. I've actually seen a marten* at Carkeek. It looked me right in the face. It was about 3m away. Astonishing thing. I'm just not sure what I heard yesterday was one. * That is, I think it was a marten. It was small–so more likely to be a marten than a fisher, IMO. I'm not big on Champagne to be honest, but if I saw that at the store I wouldn't have given it a second thought. Really, who would expect Champagne that sounds as if it were named after goblins from a role playing game to actually taste good? That all sounds wonderful. Better not stay out too long anytime; those kerbs look like they might take over! But glad you hear that you made it to walk the Creek. One day I hope to see one of those fabled martens myself.